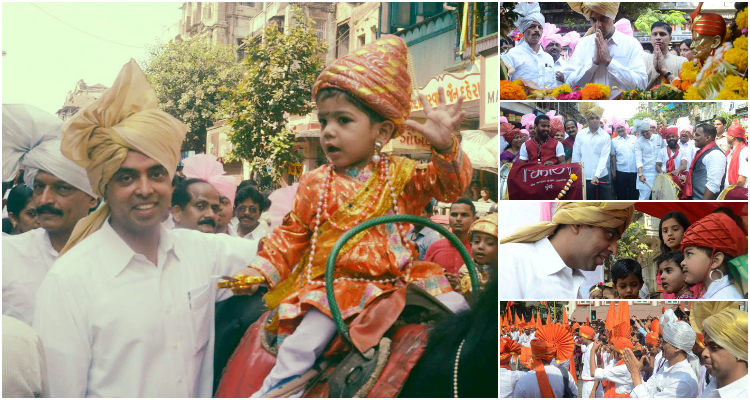 On 31st March 2014, Mr. Milind Deora was present at the Gudi Padwa Celebrations at Girgaon. Gudi Padwa is the Marathi name for Chaitra Shukla Pratipada. It is celebrated on the first day of the Chaitra month to mark the beginning of the New Year according to the lunisolar Hindu calendar. This day is also the first day of Chaitra Navratri and Ghatasthapana also known as Kalash Sthapana is done on this day. The practice of raising the Gudhi was started by Shivaji Maharaj to welcome the New Year and symbolizes victory “Vijay Dhwaj”. Since then this culture of raising Gudhi’s has been followed in and around the strong holds of the Maratha kingdom.